The nonprofit Assistance League of Long Beach, which gives thousands of school uniforms and other support to local students each year, recently provided more than 800 students at Powell Academy with backpacks, school uniforms, school supplies and books. The Assistance League's Operation School Bell and Rick Rackers programs partnered with several community organizations including the Molina Foundation and the Beta Pi Sigma Sorority on a Saturday event called "Action-Packed" at Powell. Other participating agencies included the Orthodontic Clinic, Centro CHA, Long Beach Police Department, Long Beach Fire Department, Farmers Insurance and the Long Beach Health Department. 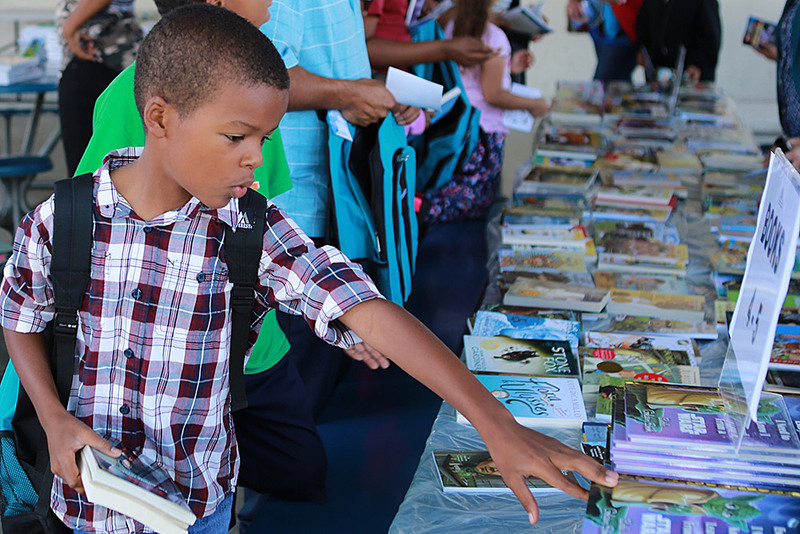 ACTION-PACKED - A student at Powell Academy selects free books during the Action-Packed event, sponsored by the Assistance League of Long Beach and other community groups.